After a 1-hour flight from Manila, we arrived in Busuanga. Asian Spirit has a jeepney that transports their passengers from the airport to Coron Town (150 php, 40 minutes). Mara, a girl from the island resort that we booked, met us at the airport. She arranged for a van for us to go to Coron Town (still 150 php). My first impression of Busuanga is that it is green, wild and isolated. It is a stark contrast to overpopulated Manila. I found the unpaved road to Coron and the fact that we didn't see another car on the road for half an hour very refreshing. I was quite thankful for the air conditioned van though as the road was very dusty. Coron Town is a charming, small town. There is not much to see or do in Coron Town, the real prize are the islands around. The pier where we took the boat to go to the island is beside the market. Anyway, in this town, everything is just beside the market. Hi, I'm planning a trip with my boyfriend to Coron. Can you provide me with contacts for the trip? 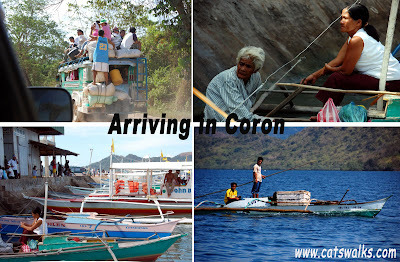 The websites of the places we went are linked to the posts about Coron.